Hong Kong’s flourishing arts scene will unite to present a month–long celebration of the arts from 1 to 30 March 2018. Hong Kong Arts Month will feature internationally acclaimed events through to neighbourhood exhibitions and community performances, held in aesthetic pockets throughout Hong Kong Island and Kowloon. Asia’s buzzing hub will be transformed into an art lover’s haven, paying homage to the classic and traditional styles through to the more modern and contemporary. The Hong Kong Arts Festival (HKAF) will be the premier event to kick-off Hong Kong Arts Month. Running from 23 February to 24 March, the 46th HKAF will feature over 1,700 international and local artists across 130 performances. Highlights include: American Ballet Theatre’s Whipped Cream; National Theatre of Great Britain’s The Curious Incident of the Dog in the Night-Time; and Welsh National Opera’s Debussy’s Pelléas et Mélisande. 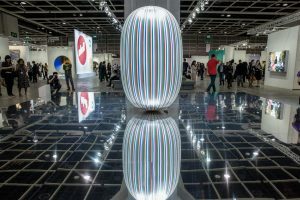 Art Central Hong Kong, will be held in the Central Harbourfront Event Space from 27 March to 1 April, with a VIP preview and inauguration event held on 26 March. Now in its fourth year, the event will introduce 30 new galleries and more than 100 international galleries, many of which are from the Asia-Pacific region. Art Central Hong Kong’s dynamic week-long programme also includes interactive installations, performances and a panel discussion, and is set to be the largest event to-date. Authentic and inspiring events in local neighbourhoods are also gems to be discovered. Sham Shui Po, a local neighbourhood which offers one of the most heritage-rich experiences in Hong Kong, is one of the highlights of this year’s Hong Kong Arts Month. The HK Urban Canvas Community Art Project, organised by the Hong Kong Youth Arts Foundation, has brought talented local artists and students together to create 10 shutter artworks that tell the stories of the local shops in the Sham Shui Po neighbourhood. Free weekend tours will run from late-March to mid-April. Hong Kong’s first international sculpture park, Harbour Arts Sculpture Park, will include sculptures by more than 18 emerging and renowned local and international contemporary artists. The event will run from 22 February to 11 April at the Central and Western District Promenade, Victoria Harbourfront, and provides a rare opportunity to view these pieces of art with the Kowloon city backdrop.